Home Education How Much is the Cost of Education in India? Do you want your child’s admission in kinder garden? Or You have a child waiting to go Primary or Secondary school? Or He/she is young enough to join a bachelor degree course in a College. You might be a parent of any these aforementioned child or children. So what you have to consider first when you have a child ready to get admitted in a school or a college? Well! I can surely say that it would be the cost of admission. Both the monthly fees and other miscellaneous expenditure related to it. Thus, in this article we will talk about issues related to education in India. How Parents Think Regarding Their Child’s Education? Before I talk about the cost of education in India, let us first debate what parents think regarding their child’s education particularly in India. I mean, how they take education of their children. According to my personal experience, normally parents are very serious when it comes to education and career of their children. It is a fact that most of parents in India take education as their first priority. Parents would spend less on everything else but they would never comprise on child’s education. Many parents even go to an extent that they would go hungry but still pay the monthly fees for the child. Hence, we can conclude that parents in India are really serious about their child’s future. Why Cost of Education is So High in India? We all know cost of education in India is very high and it is soaring. It is a fact that still a large number of populations in our country cannot afford even primary education. Forget about the higher education. The reason for this is very simple. Government still lacks a policy where it can regulate the private schools and colleges in a way that would guarantee that every child in India gets free and quality education. Moreover, there has been little done when it comes to physical and intellectual infrastructure. Physical means lack of spacious classrooms and inadequate furniture. Children have to sit on ground. Intellectual means manpower to teach our children. A teacher to student’s ratio is very high and teachers are also not well trained. Then in government schools we see a trend that teachers do not teach in their regular classes and take tuition after the school is over. Hence it means if you want to get quality teaching then you have to pay an extra money for tuition along with school fees. These things make education high in India. If we compare both, education given in private sector versus education in government sector then which one is good for you. Education in private schools is normally good but they are very costly. Even fees for kinder garden are so high then you can imagine for higher education in private colleges. On the other hand, in government schools and colleges fees are very less but quality of education is surely comprised. You will find teachers do not come to their classes because there is no accountability. Therefore, it simply means if parents have money then they opt for private schools for education and if they do not then they have no choice and send children to a nearby government school. Here, let me give you some figures. First is cost of getting admission in kinder garden and primary school. A private school can cost you around Rs 1500/- to Rs 2000/- per month for a child. You have to pay extra for initial deposit and it could run into lakhs of rupees. In government school monthly fees could be 6 to 7 times less than a private school. Second is for secondary and high school. Again in private school a child can cost Rs 3000/ to Rs 4000/- per month. In a government school it could be Rs 1000/- to Rs 1500/-. Third is higher education for colleges. Well! It could cover many disciplines like Medical, Engineering, dental, MBA etc. An engineering college course for one semester could cost Rs 50,000/- to Rs 70,000/-. A MBBS degree can cost Rs 10, 00000 to Rs 2000000/- Similarly, post graduation course like MBA could also cost in lakhs. Higher education is normally given in private institutes. There are few such government institutes where fees are relatively less. When we compare cost of education in India and abroad then it depends upon the courses you choose. Some courses which not available in India could cost you huge amount of money in countries like USA and UK. Courses which are readily available here do not cost much abroad because students would not like to go there. broad, you have to work because you do not have enough money to pay fees and your monthly expenditures. 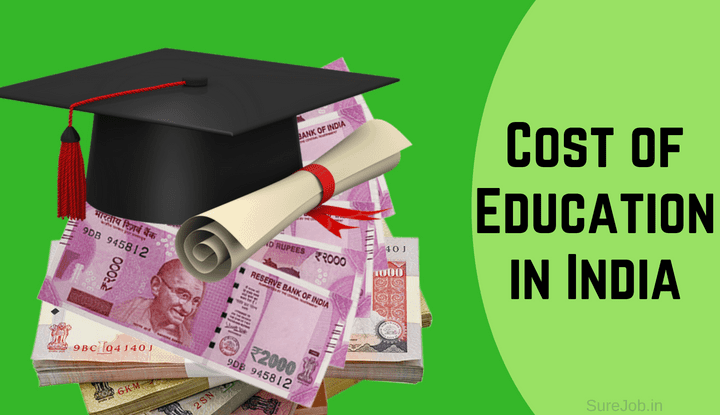 Hence, overall cost of education in India is less than compared to abroad. What are Options to cut-down the Cost of Education? As a parent your main concern should be how you can cut-down the cost of education for your child. The best way to cut-down education cost could be taking loans. Today many banks whether government or private offer plans and scheme for child’s education. Private Banks like HDFC, ICICI etc have some great packages for child loans. You can go to their website and start learning about various loans. As a parent you should prepare from now on if you want to give your child best education. Finally, there is a way out if you really cannot afford education for your child. Schools and colleges are ways to impart formal education in your children. You could prepare your child for a future where he or she would require less of a formal education. I simply mean to say starting something on your own. It could be a small business where formal education does not play any role. Here your child would need more of a real life experience rather formal education. Hence, you could choose a career for a child that does not require much of a formal education so that you could save lakhs of rupees from spending on higher education.